Scrivener is a wonderful program many writers use to set up and manage their books, screenplays, and research projects. Nearly every aspect of the program can be customizable, from the drafting settings to the export format. But with so many options, many authors find themselves overwhelmed. 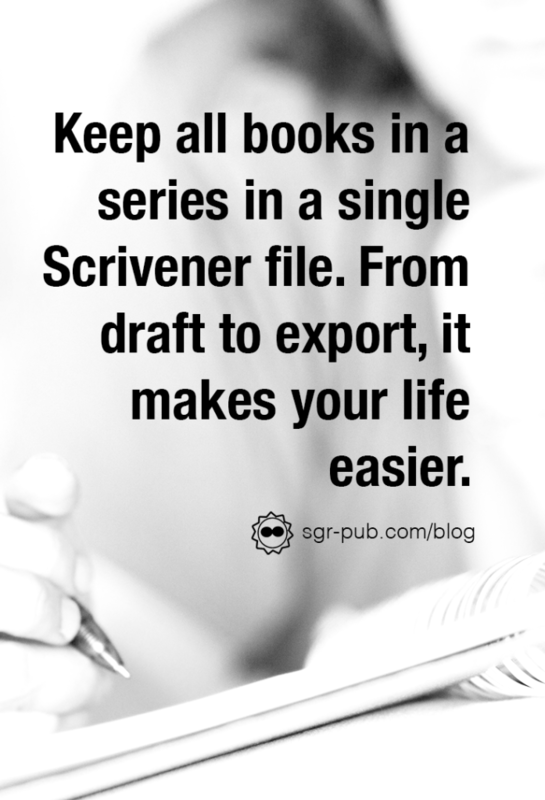 To that end, we’re posting a blog series on our favorite features of Scrivener. Today, we’re going to cover how to set up a project in Scrivener, including some tips and tricks to set you up for success. Again, don’t let the options daunt you–and don’t feel that the templates will lock in you into a specific feature set. Everything is customizable. The templates simply pre-select some features, like adding placeholders for places, scenes, and characters. If you don’t need any of that, feel free to use the blank template. No matter which template you use, when it comes to the act of writing your book, you’ll just need to focus on the box in yellow. That is your manuscript, a template chapter, and a template scene. From here, it’s a matter of organizing your book to meet your needs. Then scenes in the lowest folder. We’ll go into how each of these levels get formatted in a later blog post. Having everything in a single Scrivener file does a couple of things for us. First, it’s super easy to recall back to a previous book for a question. Second, export features are consistent across the board (although be careful about book headers here). Finally, when we’re compiling an eBook box set, there’s still a single master file to compile from. Because of the modular nature of Scrivener (that is, everything is in pieces), you can reorganize as your story unfolds. It’s easy to drag a scene from Chapter 5 to Chapter 10, or to send the entire Chapter 2 to the Trashbin. Even better: if you decide Chapter Two is salvageable after all, all you have to do is drag it back to the main project. 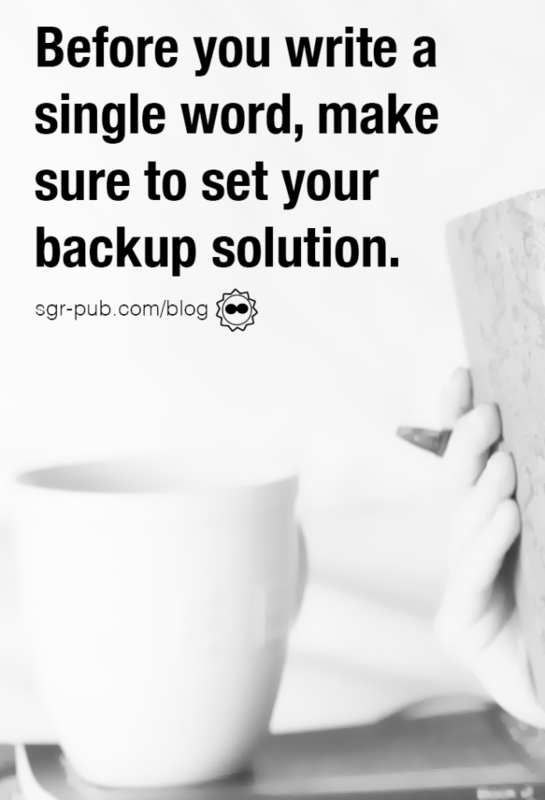 Before you write a single word, you should make sure your backup is in place. Every author has horror stories about computer crashes, coffee spills and the like. Therefore, it’s imperative that you set up a system that is both efficient, but also doesn’t require you to do more than set it up. Scrivener offers two options for this. First, you can opt to save your file in a Cloud Storage Solution. Therefore, instead of your desktop, your Scrivener file will be saved in Dropbox or iCloud. To do that, simply Save As to your cloud storage solution. (Need help setting that up? Check the bottom of this blog post for links to tutorials). 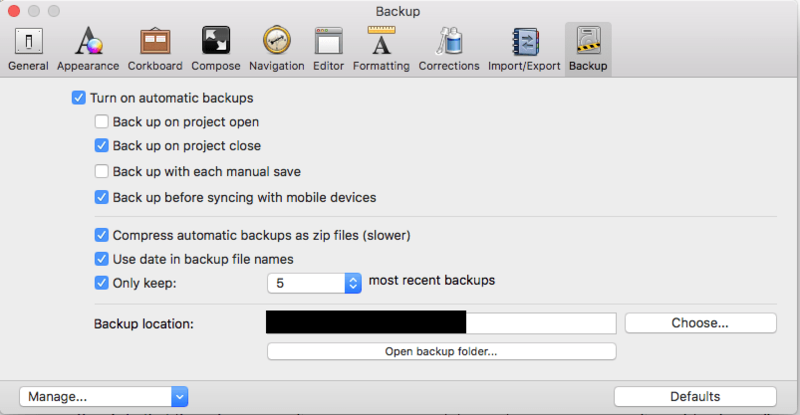 The second feature Scrivener offers is the ability to save a backup of your file. For those of us paranoid about system failures, we opt to save the backup of our file in a different storage solution.